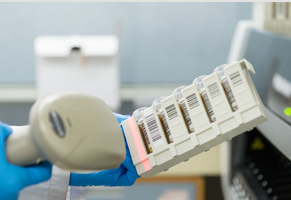 CRLB has vast expertise in the shipment, reception, storage and analysis of large numbers of samples from more than 85 countries representing every region of the globe. The CRLB QMS utilizes process control and project management approaches, and quality management principles contained in the ISO 15189:2012 accreditation program for continuous quality improvement. The QMS encompasses all operations at our facility located at Hamilton General Hospital and this manual establishes compliance with ISO 15189:2012. All operations are governed by Standard Operating Procedures (SOPs) and study-specific SOPS are developed with each Principal Investigator prior to study initiation. Attention to detail ensures studies are initiated on time and project changes are integrated rapidly and smoothly. Our experienced Project Management Team and customized project materials, as well as a strong commitment to customer service, ensure rapid and effective resolution of issues.